I went to the Ottawa Stampin’up Demonstrators Conference this week-end and I really had a blast! It was great to meet all these amazing women, all passionate about stamping and papercrafts just like myself!!! There was a Card Contest for Ronald McDonald house. I didn’t win, but I can show you the special card I made. There was no special criteria except that the card couldn’t have any “writing” on it. I didn’t really want to do a Christmas card, but a Bright and Cheerful one! What do you think? I used the “Bokeh” technique in the background. To do this technique, you sponge the background with the colors of your choice. I used Daffodil Delight, Crush Curry, Pumpkin Pie and Calypso Coral. Then you make a mask with various size of circles and you sponge those circle with Whisper White Craft ink. I heat embossed the Pine image (from Ornamental Pine stamp set) with Basic Black embossing powder and I added a few rhinestone jewels for some additional sparkles! The card base was embossed with the Delicate Designs embossing folder. I sponged some White on top to make it even more visible. Ink: Versamark, Basic Black embossing powder, Daffodil Delight, Crush Curry, Pumpkin Pie and Calypso Coral, Whisper White Craft ink. Tools: Heat tool, Big Shot, Delicate Designs embossing folder. Today’s card is using the “Heat Emboss resist” Technique. For this technique, you stamp your image in Versamark ink and heat emboss with White embossing powder. You can then use a sponge to add the color you want and the image stays white! It’s really cool! 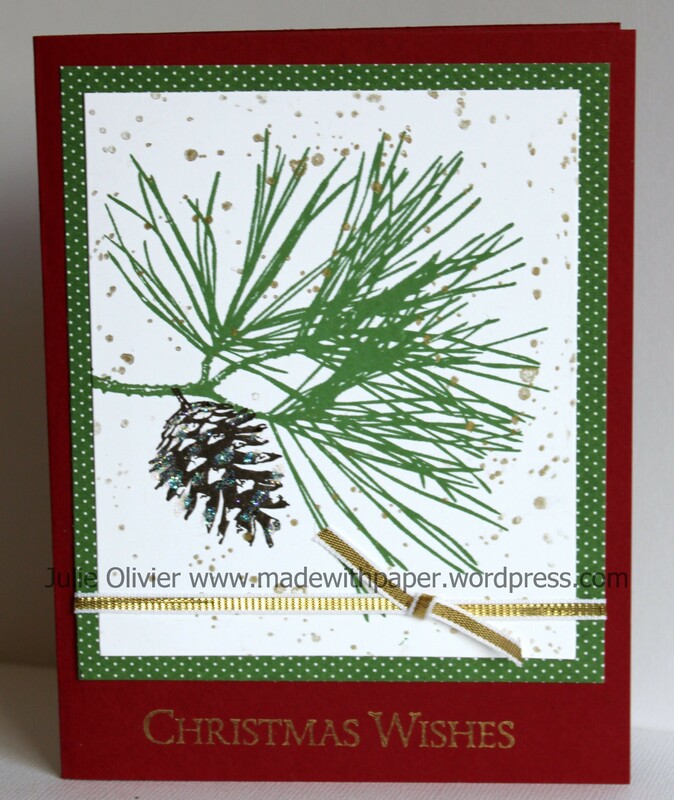 For this card, I used the “Ornamental Pine” stamp set and Lost Lagoon ink sponged all over. The words, also from the same stamp set, were stamped in Lost Lagoon as well. If you have seen my Blog post on Monday, you know that I designed the Make and Takes for the Abbotsford’s Stampin’up Conference (for Stampin’up demonstrators) that took place last week-end. I showed you the Friday night Make and Takes but I also designed the Make and Takes for the Saturday afternoon session. 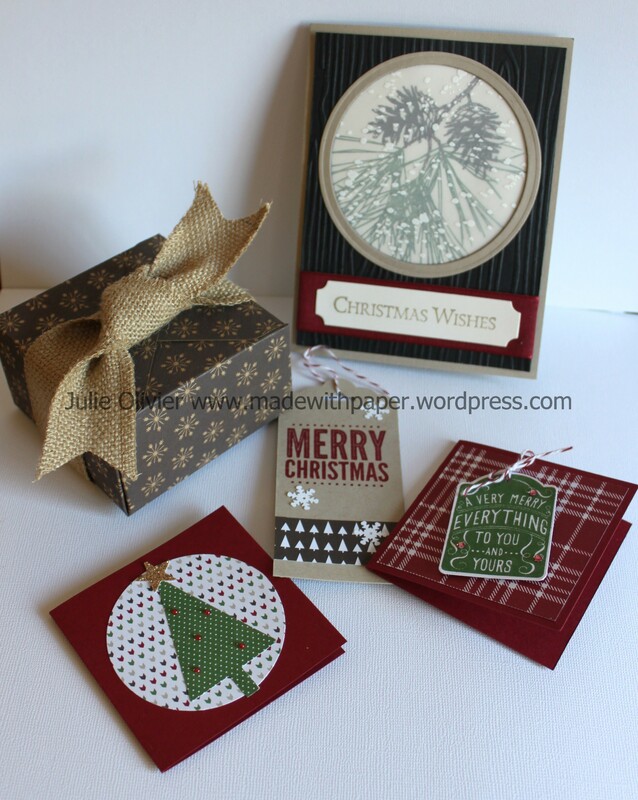 For the Saturday Make and Takes, I was asked to use the stamp set “Ornamental Pine“. Here’s what they made: a card, 2 mini-cards that fit in a gift box and a gift tag. 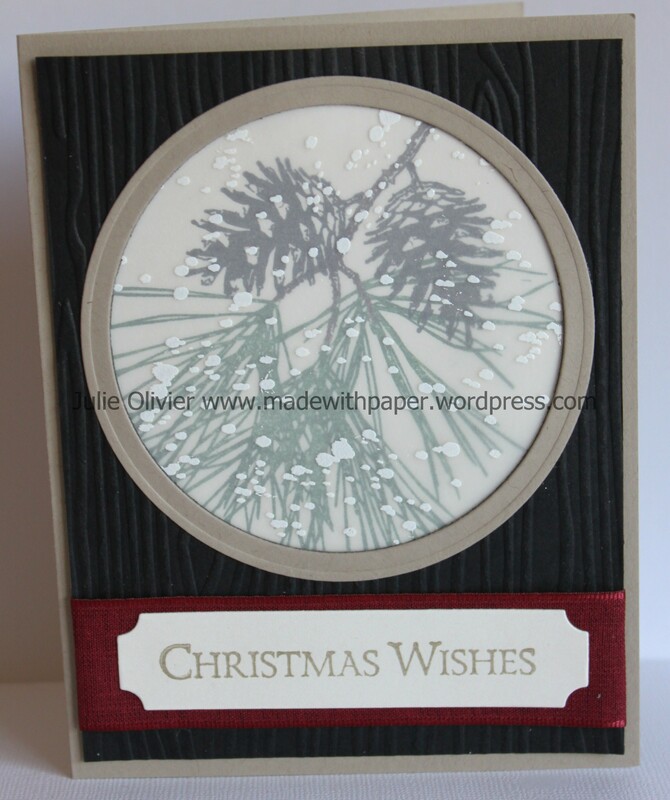 The card was my favorite project, with a Vellum overlay embossed with White “snowflakes”. 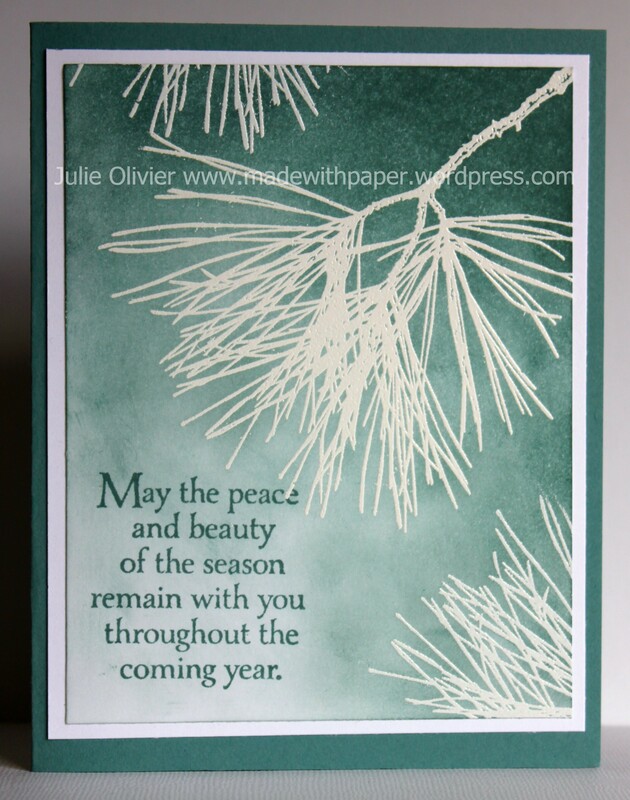 The Pine Tree and cone were stamped first on Very Vanilla card stock, in Garden Green and Early Espresso ink. Than, a piece of Vellum was stamped with the “Gorgeous Grunge” stamp (ink splatters) with Versamark and heat embossed with White embossing powder. The top of the card was Basic Black card stock embossed with the Woodgrain folder. An opening was cut with the Circle Framelits dies. An other Crumb Cake circle was also cut with the Circle Framelits to make like a frame. The greeting was stamped in Gold Metallic ink and cut with the Project Life Cards and Labels Framelits Dies. Here’s the 2 mini cards. They are very simple, but what I like about those 2 cards, is that the mini pearls and the rhinestones were colored with the Cherry Cobbler Blendabilities Markers. (Yes! Blendabilities markers can color on those so you can now have pearls and rhinestones any color your like!!!) I used the 2-1/2″ Circle punch and the Tree punch on the first one and the Merry Everything and Note Tag punch on the second. The Designer series paper is from “Trim the Tree Designer Series paper stack“. 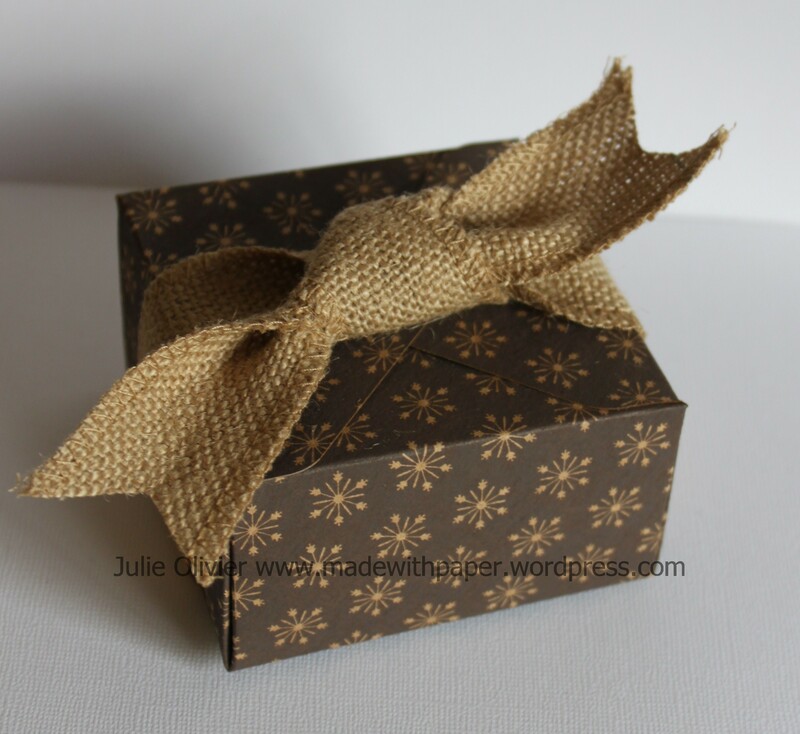 The Gift Box was made with the Gift Box Punch Board and the “Under the Tree Specialty Designer Series paper.” A Burlap ribbon was perfect to add a nice finishing touch! 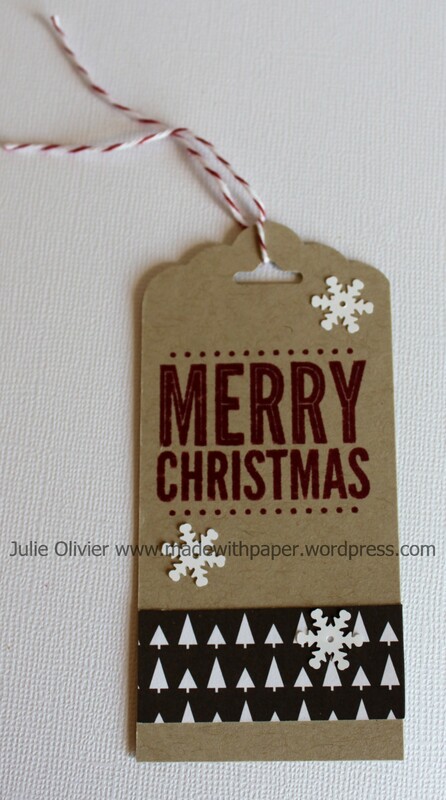 The last item was a Gift tag, made with the Scalloped Tag Topper punch and “Merry Everything” stamp set. 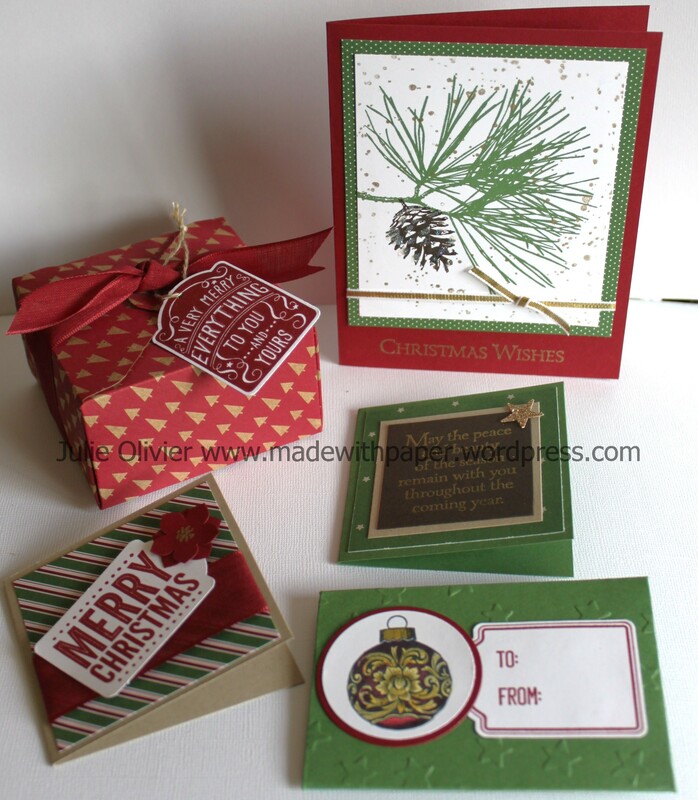 For the Saturday’s Make and Takes, I was given the “Ornamental Pine” stamp set to use as the main stamp set. I was really happy because I love this set! Here’s the projects that I designed for the other demonstrators to make: one card, 2 mini-cards and a box (the cards fit in the box) and a Gift Card holder. The 2 mini-cards were 3″ x 3″. 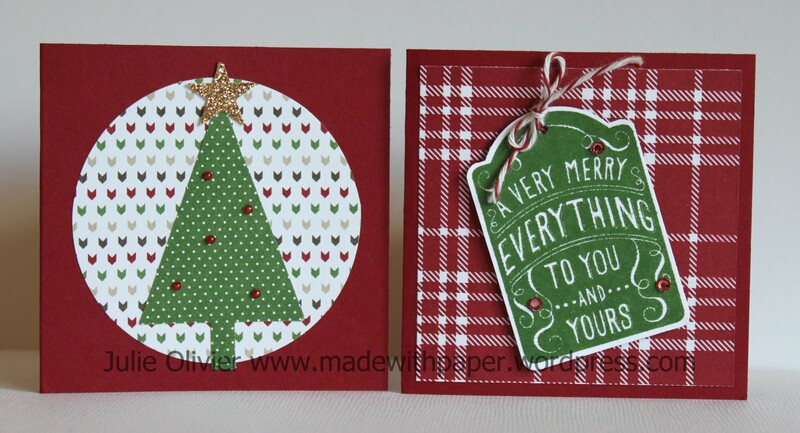 The Designer Paper in the background is from the “Trim a Tree” Designer Series Paper stack. I wanted to make a poinsettia, so I used the Petite Petal punch (2 flowers, on top of each other) and I used the Gold Stampin’ Dazzle Marker (love that pen!) to make the flower center. The “Merry Christmas” is from “Merry Everything” stamp set, cut with the Note Tag punch. (Get these 2 items 15% off when you buy this bundle). For this one, I used the words from Ornamental Pine, heat embossed in Gold on Early Espresso card stock. 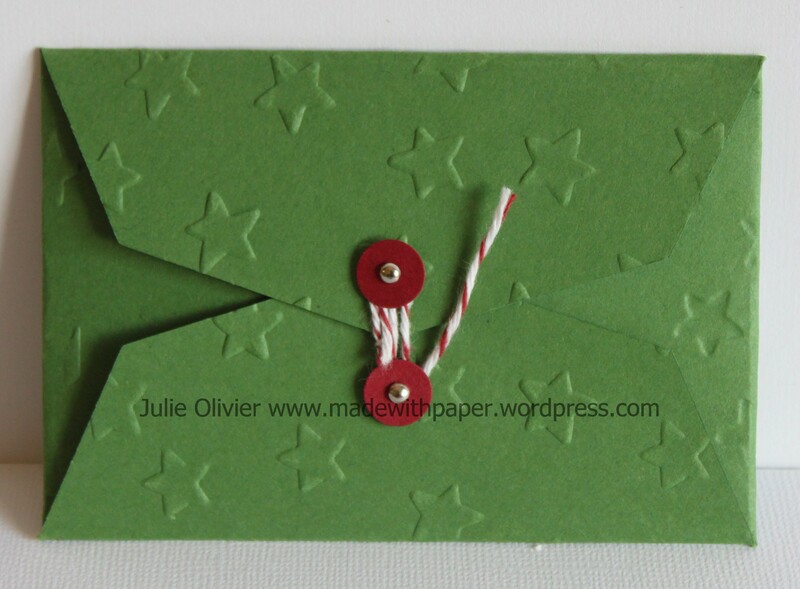 A little Gold Glimmer paper star complete the card. The Gift Card holder was cut with the new Gift Card Envelope & Trims Thinlits Dies. 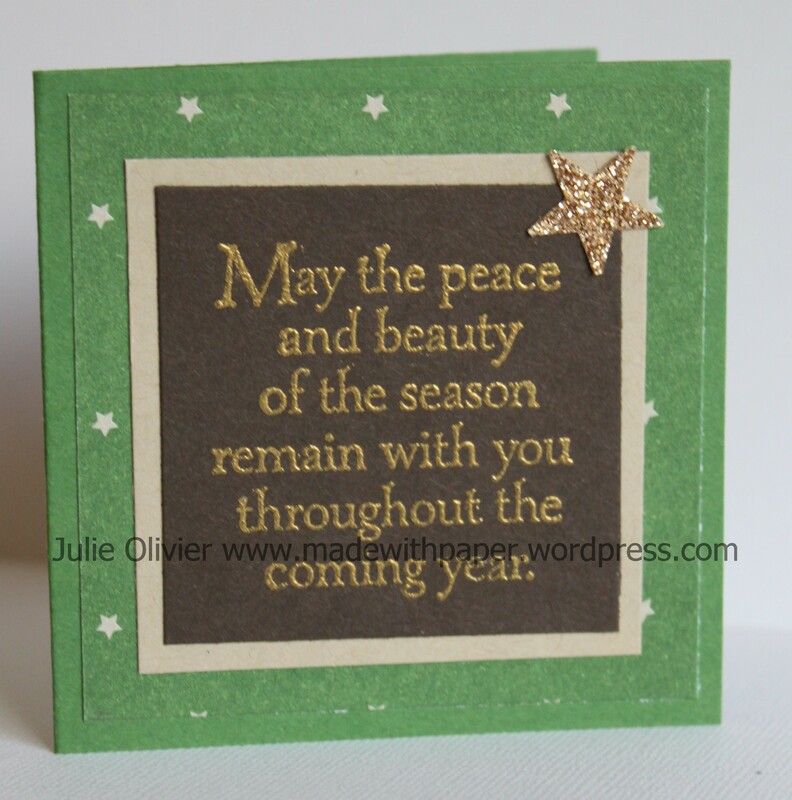 I used Garden Green card stock that I embossed with the Lucky Stars embossing folder. 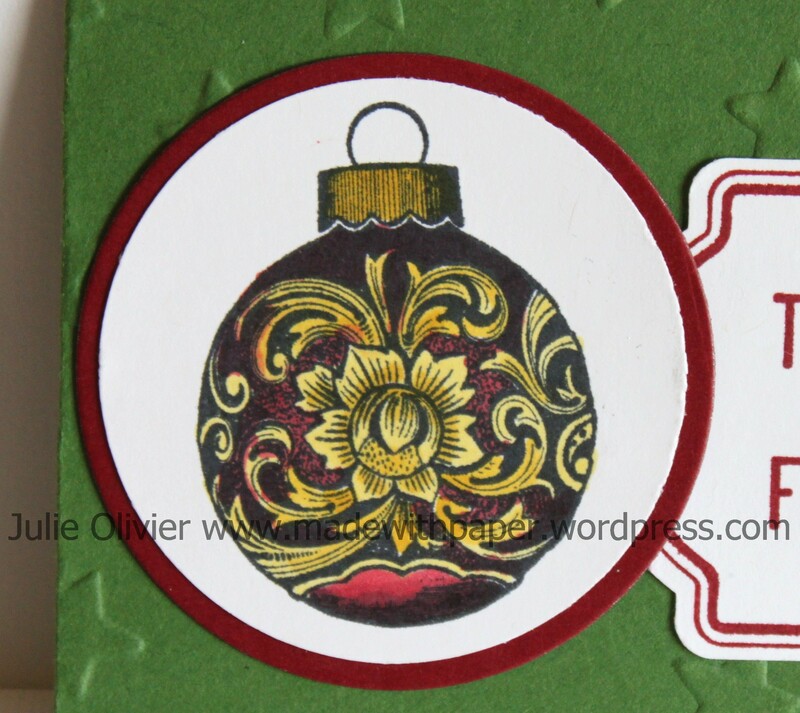 The Christmas ornament is also from the Ornamental Pine stamp set. I used the Daffodil Delight and Cherry Cobbler Blendabilities Markers to color it. 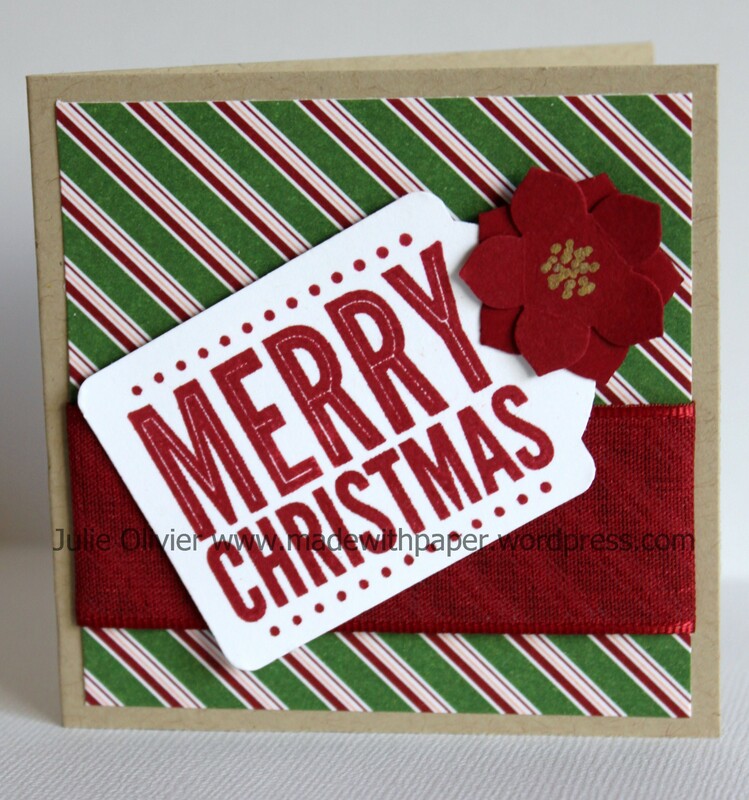 The tag is from Merry Everything stamp set and cut with the matching Note Tag punch. Finally, here’s the box made with the Gift Box Punch Board. I used the “Under the Tree Specialty Designer series paper . This is Cardstock-weight sheets with color print on one side and White printed patterns on the other. It’s perfect to make little cute boxes in no time! 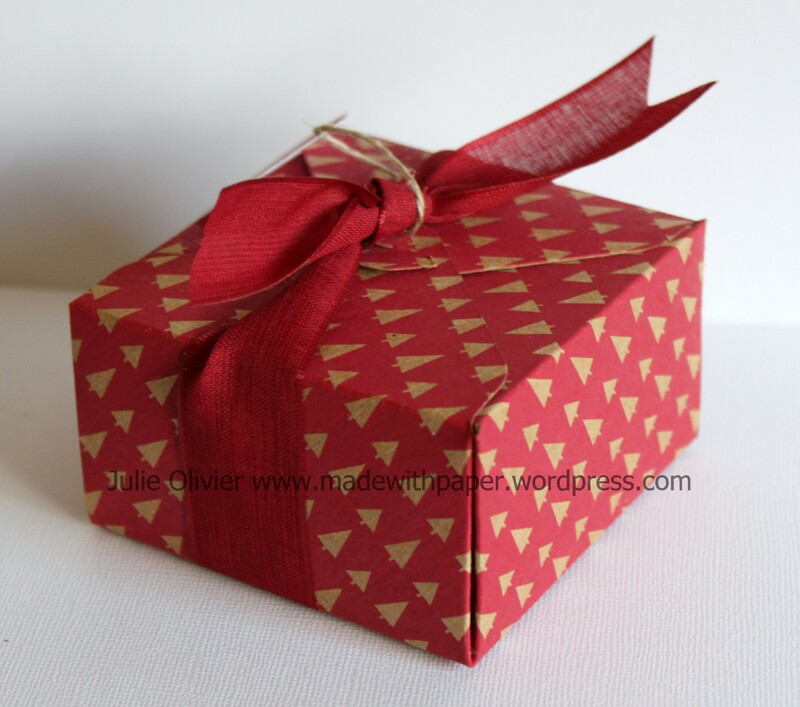 A Cherry Cobbler 1″ Sheer Linen ribbon is tied to the box. 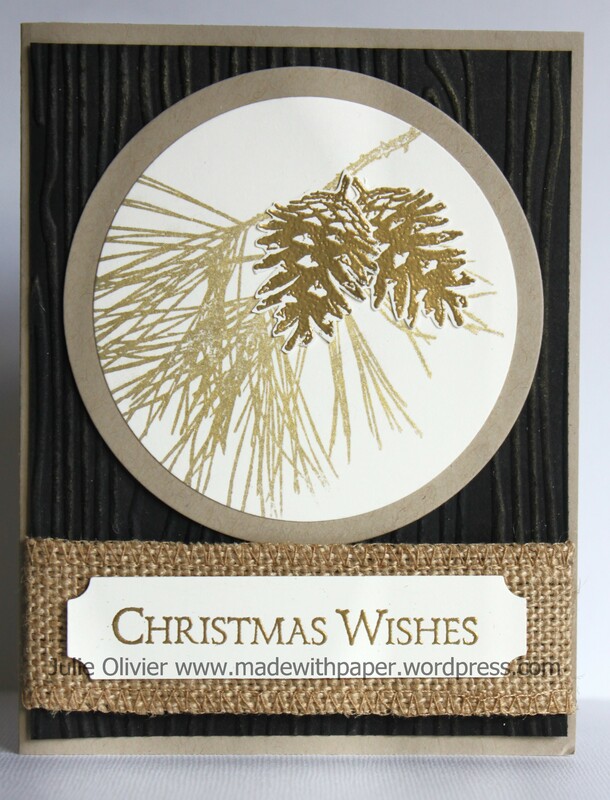 Today’s card is an elegant Black and Gold Christmas card made with the new Ornamental Pine stamp set. The background is Black card stock embossed with the “Woodgrain” embossing folder. I stamped the pine needle with the Metallic Encore gold ink and the 2 pine cones are heat embossed with gold embossing powder. A burlap ribbon completes the ‘rustic” look. 1. Cut half a sheet of Crumb Cake card stock (8-1/2 x 5-1/2). Fold in half to form the card base. 2. Cut a 4″ x 5-1/4″ Basic Black card stock. Run through the Big Shot with the Woodgrain embossing folder. Wrap a Burlap ribbon around the bottom of the Basic Black embossed card stock, folding the 2 ends at the back and glue them with Snail adhesive. Adhere to the card base. 3. 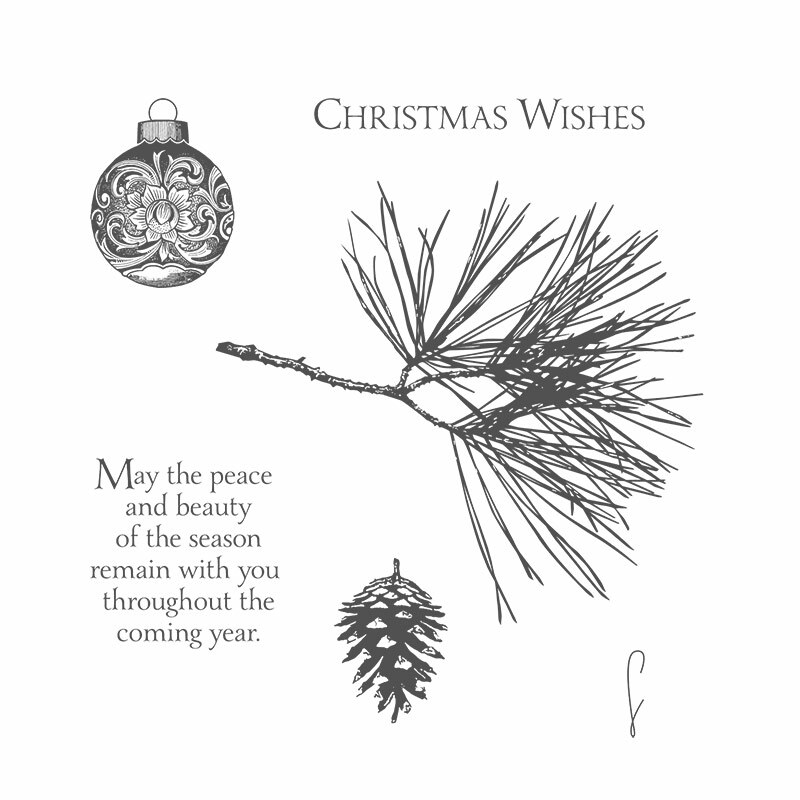 Stamp the “pine tree” image with Gold Metallic ink on a piece of 3.5″ Vanilla card stock. Cut with the Circle framelit die. Cut one size bigger circle in Crumb Cake card stock. Adhere the 2 circles on top of each other. Adhere on the card. 4. Stamp 2 pine cones image with Versamark ink on Very Vanilla card stock. Cover with Gold embossing powder. Shake off the excess and heat emboss with heat tool. Cut around the pine cones with scissors and adhere on your card. 5. 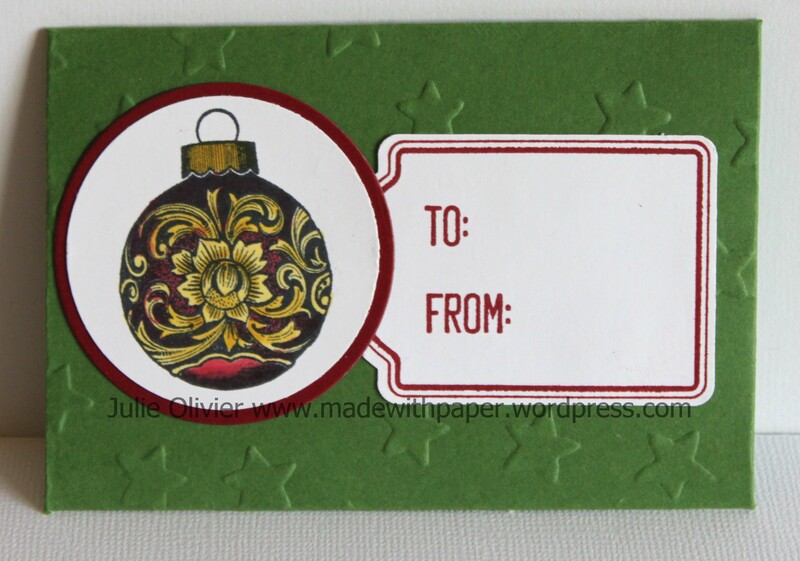 Stamp “Christmas Wishes” in Gold ink on Very Vanilla card stock. Cut with the Project Life Cards and Labels Framelits die and Big Shot. Adhere on the Burlap ribbon with glue dots.